Fairbanks-based artist Ernie Titus creates work that serves as an intricate, natural extension of his identity and indigenous heritage, while simultaneously reflecting an artistic vocabulary informed by contemporary drawing and intermedia art. Titus, 66, is originally from a remote Athabascan community on the Tanana River deep in the Alaskan interior; Ernie was one of fourteen children raised by a well-respected creative family in Minto, which is known for its closeness to the Lower Tanana Athabascan tradition. His adoptive mother, the late Dorothy Titus, was a prominent community elder and song leader who composed dance songs (as a revitalization effort to preserve the endangered Lower Tanana language) that are still performed at Minto gatherings. In the studio, Titus moves with intention and doesn’t leave work unfinished - deliberate, thoughtful, and thorough in every act. His shirt is crisp, clean, and appears to be brand new. Working primarily from memory, his hand engages the paper with great sensitivity to its pristine surface and a steady confidence in his intuitive approach to mark-making. 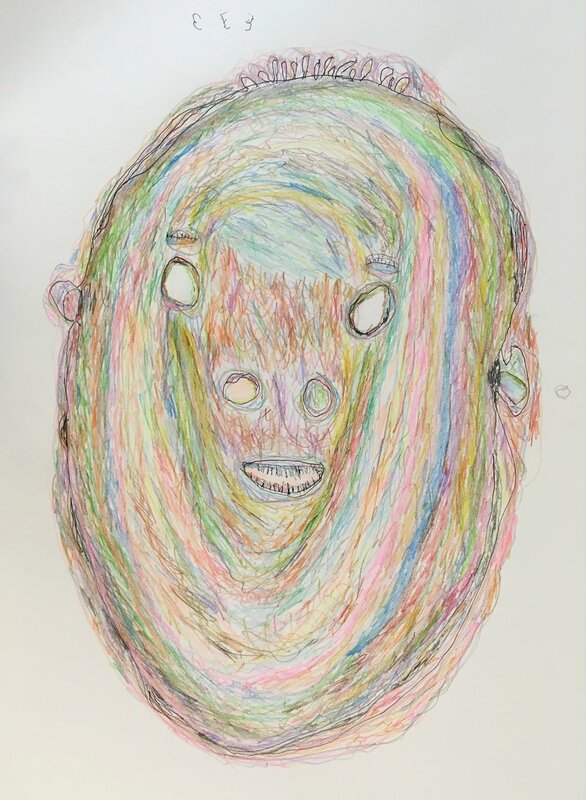 Titus’ drawings employ delicate, wavering lines in ballpoint pen, graphite, and colored pencil, rendering spectral visages reminiscent of Mose Tolliver’s self-portraiture. Singular figures are composed of strange forms and facial features that occupy space in curious ways - asymmetrical eyes and irregularly formed nostrils float freely in over-sized heads, diminutive appendages cling to the exterior edges, and short, cilia-like strands of hair loosely collect along forehead arcs, flat eyebrows, and the perimeters of half-open mouths. Titus has the sort of creative practice sometimes seen in progressive art studios - the daily rituals of Evelyn Reyes or Jeff Larabee’s letters to Gotham City for instance - where there is little to no separation between an individual’s typical routines and intentional acts of art-making. Titus’ practice operates on priorities removed from exhibition or even the creation of a permanent object. It would be a stretch to characterize it as performative, but considering his actions from this perspective may provide valuable insight. Titus’ work is divergent from traditional concepts of drawing in that the element of mask-making is central to his execution. Rather than creating sculptural paper masks, Titus instead uses the process and materials of drawing to engage the paper, resulting in a two-dimensional object with a compelling language of drawing - agile lines articulated in his distinct hand, which are subsequently cut out, providing non-functional eye-holes or holes that reference eyes. This work thus embodies Titus’ understanding of its purpose as that of a mask to be worn. The space these works occupy, between function and non-function, between art and accoutrement, extends dynamically into his daily activities in the studio. Ernie usually asks for three large pieces of white paper, using the paper to either make a hat or mask. Often the hat is a disc with two pieces of string which staff help tie to the sides and he wears it like a bonnet; sometimes he will design different types of hats. If he is not making a hat, he makes a mask, and this is usually fairly small, drawn with ballpoint pen on white paper. He cuts out the eyes and nose and mouth, but sometimes he makes masks that have bodies attached and has even drawn a mask within a mask. He has staff tie them onto his forehead since they are often too small to see through; he always asks for it to be tied tight. In a three hour block, he can spend most of his studio time making the hat or mask. On other days, he works on drawing images of faces or masks...when drawing, he starts with pen and pencil, and alternates between the the two. It is unclear how he decides which one to use. He will draw most of a circle or oval with one, and then use the other to close the circle. Then he uses colored pencil to fill in the whole mask. He uses many colors, and seems to be making very specific choices about which color to use. Depending on the size of the piece, he can spend roughly 2-4 sessions on each drawing, and sometimes he spends the whole day making hats and masks. Rachelle Crandall, an artist also from Minto, explains that although mask-making is lesser known in Athabascan tradition than other Alaska Native cultures, it does have a presence in their history. Titus’ intuitive understanding of and reverence for art as something to be worn or “put on” seems to reflect an innate connection to his cultural history that isn’t explicitly taught - which is in fact expressed in a way which could not be taught. Abstract of the ongoing, developing mystery of the true nature of Titus’ creative practice and intentions, his work engages with the process of drawing in thoughtful and highly original ways. His hand has a compelling way of activating space in the picture plane, incorporating small details amid marks that are deceptively disorganized. His amorphous depictions of faces are reductive, but the distortion of simple facial features seems deliberate, not haphazard, repetitively tracing the irregular contours of invented forms. Ernie Titus has always engaged in art-making, but has been creating work in a more formal studio setting at the Fairbanks Resource Agency since 2016. Titus’ drawings were recently exhibited in Fairbanks at the University of Alaska Fairbanks Gallery and previously in Interior Visions curated by Phoebe Rohrbacher at Bear Gallery.